Present workarounds that will prevent the user from getting errors that can halt productivity when using Hypersonic 2. These two go hand-in-hand because #1 directly gives the workaround mentioned in #2. When this happens, Hypersonic 2 defaults to the “Welcome to the Matrix” preset, and if you don’t remember what preset you used, you’re dead in the water. 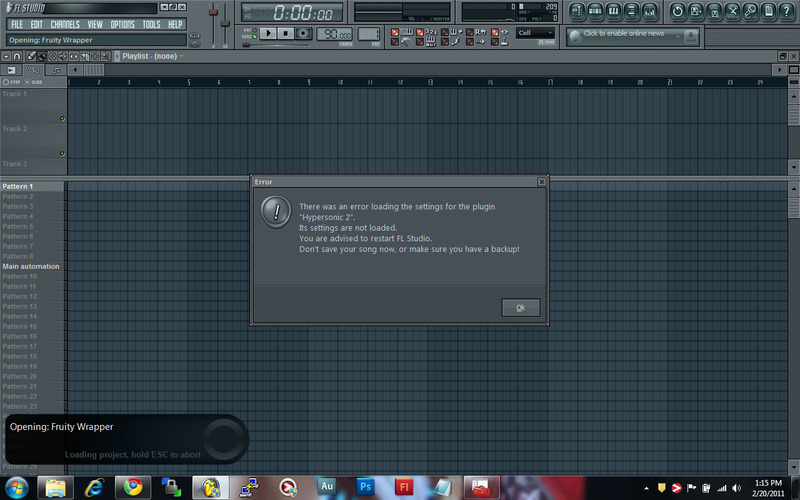 This can also get very frustrating when you try to save a project with Hypersonic 2 and FL Studio will freeze then crash, killing your progress, or automatically crashing when adding Hypersonic 2 to your project. We will go over two different scenarios. Starting a new project, and modifying one that exists (and you possibly getting the error pictured above). Now I know these can be a pain, but unfortunately, it is a discontinued product, and we can only do workarounds. Once you get into the habit of these workarounds (some are good practice anyway), it’ll become second nature. Whether or not you use Hypersonic 2, make it a habit to open one up first before any other VSTi on a fresh session of FL Studio; meaning as soon as you double-click FL Studio, add Hypersonic 2 right away. I’ve noticed it conflict with other VSTi’s and crash upon adding, so adding it first gets rid of that quirk. DO NOT ASSIGN NOTE VALUES (STEP SEQUENCER OR PIANO ROLL) TO HYPERSONIC 2 ITSELF. That may sound strange to you, especially if you haven’t been using FL Studio for that long. 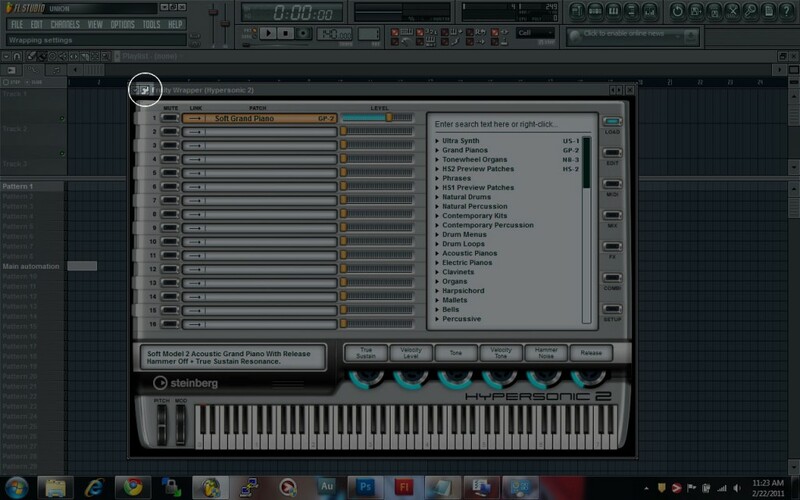 The correct way however to assign notes on Hypersonic 2 is through MIDI Out Channels. 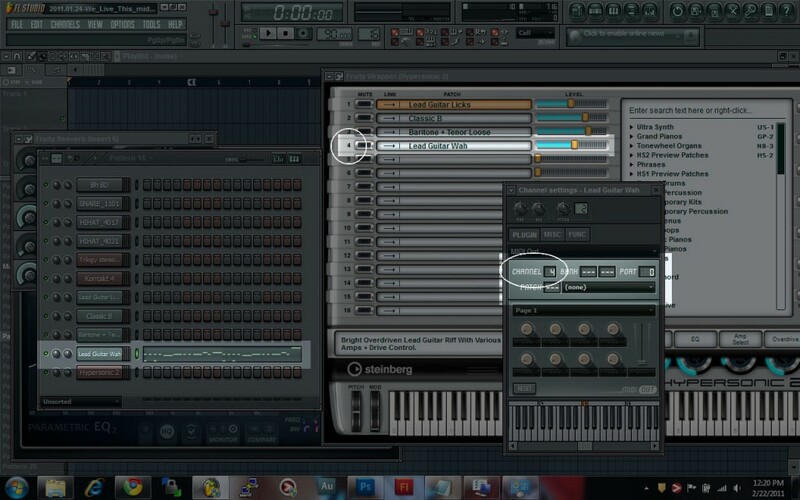 This way, you can use different multiple instruments and only ONE HYPERSONIC 2 INSTANCE. This method works for the other big multi-instrument VSTi’s as well, including SampleTank and Kontakt instruments, albeit with slightly different methods due to the differences in interface. To make this clearer, let’s take a look at the Hypersonic 2 interface. The highlighted area is where you would pick your instruments. I know some people simply pick one instrument for this instance of a VSTi, then open another instance to use another instrument preset. It’s a waste of DSP power, and considering how many high quality VSTi’s are resource hogs, you need all the processing power/memory you can get. The correct way would be to use MIDI Outs. By linking a MIDI Out to each of the 16 available slots above (counting “Welcome to the Matrix” in the first slot), you can control up to 16 instruments off of one instance of Hypersonic 2. As I’ve said earlier, this also goes for SampleTank, Kontakt VSTi’s, and others, so bear that in mind when using other VSTi’s as well. How do you do that, you may ask. First, we have to assign a MIDI Input Port on Hypersonic 2. This can be done through the settings window by clicking on the gear icon on the upper left of the Hypersonic 2 window (other VSTi’s get this box as well). Check the picture above for refernece. After clicking on the VSTi Settings Button, you get the window above. Here, you will set the MIDI Input number to a number of your choice. It’s defaulted with “–” and by changing this to a particular number you give the MIDI Out channels a port to reference when sending the input from the Step Sequencer or Piano Roll or from your MIDI Controller. In this case, it’s set to 0. Next, add a MIDI Out Channel, which is done similarly to how you add a sampler, or audio clip channel. Notice above how on the MIDI Out Settings there is a Channel setting (number), and a Port setting (number). The Port should match the number you chose for your VSTi. For example, if you selected MIDI Input Port 0 on your VSTi settings, your Port setting on the MIDI Out should be 0 as well. The Channel setting corresponds to the number instrument you chose on Hypersonic 2. Using the instructions above, we can use multiple MIDI Outs to control multiple instruments off of one instance of a VSTi. In the example above, Hypersonic 2 was assigned a MIDI Input port of 0, and the “Soft Grand Piano” is on channel 1, and the “Brassy Orchestra XXL” is on channel 2. The two MIDI Out channels, labeled “MIDI 1 – Piano” and “MIDI 2 – Orch” are set to play those instruments by setting their Port settings to 0, and their channels 1 and 2 respectively to correspond how they are assigned in Hypersonic 2. You can test this out by clicking on either of the MIDI channels and play using your keyboard or MIDI controller, and you will notice that the MIDI Out channels are playing the instruments from Hypersonic (or whatever VSTi) as assigned and you no longer have to assign note values to the step sequencer or piano roll of Hypersonic. All note and other settings can be done through the MIDI Outs. PLEASE NOTE: Although you can assign notes and other MIDI values to MIDI Outs, you cannot assign MIDI Outs to go to effects. Only the VSTi itself can be assigned to an effects channel in this case. If you get errors, such as the one shown in Figure 0, the workaround is as follows. Once you do this for your project, you won’t get these errors again provided you do not assign note values to Hypersonic 2 itself. 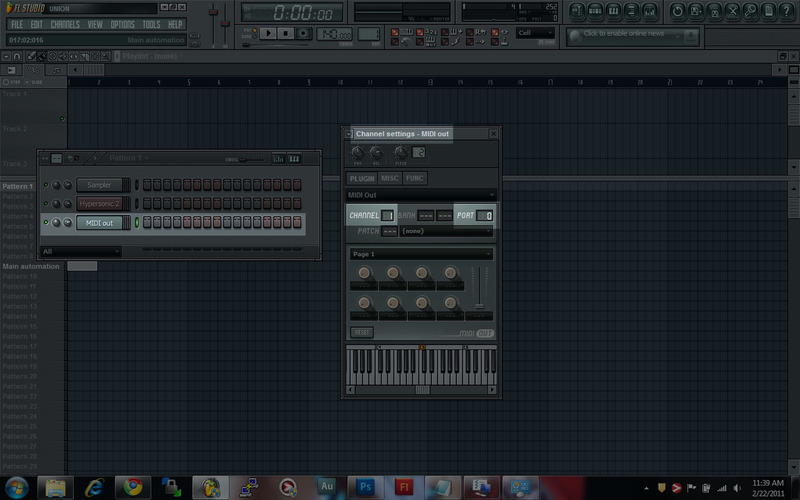 Upon opening FL Studio, add a Hypersonic 2 VSTi channel. Make sure it loads properly. 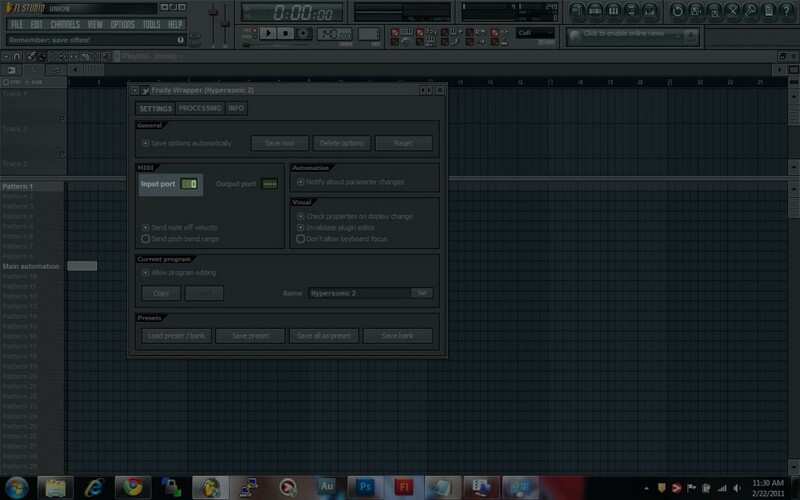 This will prevent FL Studio from crashing when Hypersonic 2 opens in your project. Assign the MIDI Input Port in the existing Hypersonic 2 instance (refer to figures 2011-02-20/2 and 2011-02-20/3 above) to a number of your choosing. If you have multiple instances of Hypersonic 2 open, write down what instrument presets you used, and mark all Hypersonic 2 instances (except for one, which will be the main one we will use for the project). Assign the instruments you had written down to the one instance of Hypersonic 2 (see figure 2011-02-20/6 above). 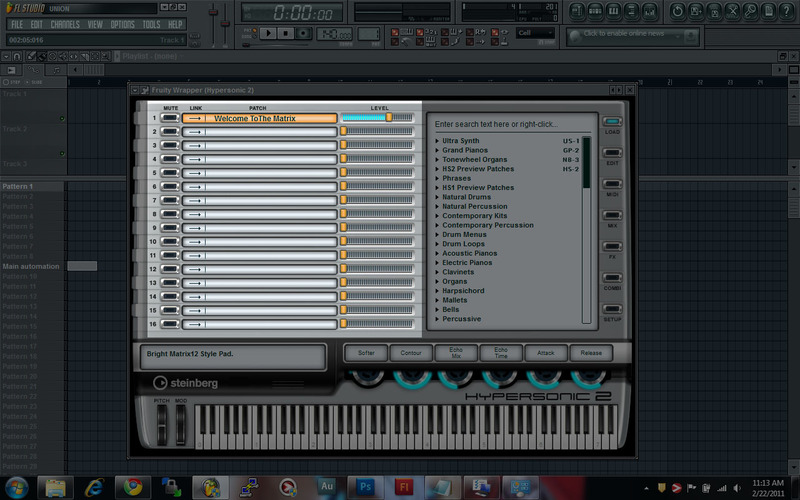 Assign the MIDI Input Port to the one Hypersonic 2 instance remaining. 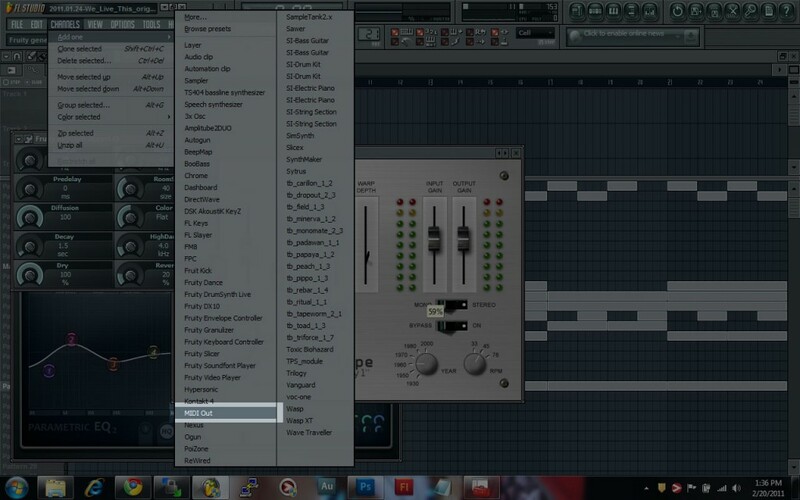 Add as many MIDI Out channels as you have Hypersonic 2 instruments. If you have three instruments on your once instance of Hypersonic 2, then have three MIDI Out channels. Assign the Port setting in those MIDI Out channels to the MIDI Input Port number you used for Hypersonic 2. Assign the Channel settings in those MIDI Out channels to correspond to the instrument you wish for it to control. For example, if instrument #2 on Hypersonic 2 (assigned MIDI Input Port 0, for example) is “Lead Guitar Licks,” and you want one of your MIDI Outs to control it, the MIDI Out Settings should show Port 0, Channel 2. Copy/paste your step sequencer and piano roll settings to the corresponding MIDI Out Channel so that the note values, velocity values, etc. will no longer be on a Hypersonic 2 instance. They will be on the MIDI Out Channel instead. See below for an example. Once you’ve got everything moved properly, write down the instruments you used on Hypersonic 2, along with what number were they on Hypersonic. In the example above, “Lead Guitar Licks” is 1, “Classic B” is 2, etc. Once you’ve noted everything down and you are certain everything is moved over properly (notes and all), delete the last Hypersonic 2 instance, so that there are no Hypersonic instances whatsoever in your project. All your notes and velocities etc. are all moved over to MIDI Outs so they will be preserved. Save your project. Your project should save with no errors. Exit out of FL Studio. Add a Hypersonic 2 VSTi instance. Reassign the instruments on Hypersonic 2 the same way you have written down. All the MIDI Outs still have their port and channel settings, so your notes, velocities, etc. will still correspond to the same instruments as long as you have them assigned the same way. You will not need to re-enter any notes or other information anywhere. Save your project. You should get no errors. From here on in, all changes to notes, velocities, etc. will be made to the Piano Roll’s or Step Sequencers of the MIDI Outs and not on Hypersonic 2 itself. 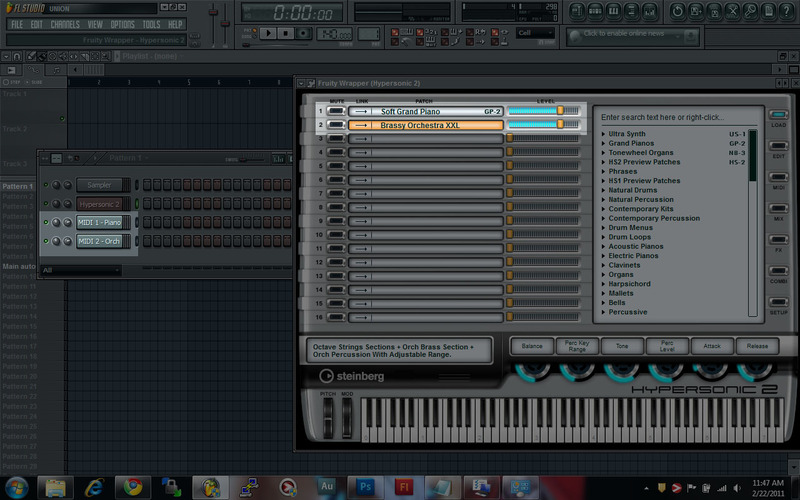 You may also add instruments to Hypersonic 2 now, provided that you use a MIDI Out for each new instrument you use. Remember: NO NOTES ON HYPERSONIC 2 ITSELF, ONLY ON THE MIDI OUTS. I can’t stress that enough. That’s it. If you ever open up your project from here on in and get an error about loading the settings, just do steps 11-14 above, and only those steps ONLY. Your settings will load normally, and you won’t have to reassign anything. So that should do it. I’ll be making a video to outline everything later, so look out for that if anything is unclear about these instructions. As always, hit me up at moonshyne@moonshizzleproductions.com if you have any questions for me.